Did You Know? Chocolate is Good for You! This is one piece of advice that we’re happy to give: chocolate is good for you! Not all chocolate, and moderation is key, but dark, 70 percent cacao or higher chocolate (as well as unsweetened cocoa), has been shown in study after study to be healthy. 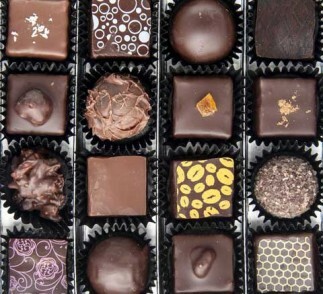 Since February is heart health month, it’s worth noting that daily chocolate consumption may reduce the risk of heart attack and stroke in some high-risk patients, according to a 2012 study in the journal BMJ. Cocoa also has outstanding vascular health and cancer fighting properties, due to the phytochemicals used in the chocolate production process, according to resent findings. These chemicals may improve blood circulatory function such as blood vessel health, slow blood clotting and improve insulin resistance. The secret behind chocolate’s powerful health benefits is cacao, which is packed with flavonoids and theobromine. But cacao on its own is bitter and chalky, so milk and sugar are typically added to maked it more palatable. When recommending chocolate, we’re not talking about processed, junky candy bars, or even milk chocolate. We’re talking about the pure stuff – as pure as possible (some 90% bars are excellent), and no chocolate binges please! An ounce a day is perfect. Our love for chocolate goes back much further than Valentine’s Day treats. The Aztec’s referred to chocolate as “the food of the gods”. As a Valentine’s Day tie-in, the Aztec ruler, Montezuma, believed chocolate was an aphrodisiac. Christopher Columbus enjoyed this ancient American When chocolate first made it to Europe, it was a luxury product only enjoyed by the wealthy aristocrats. Later on, production efficiencies made it more affordable for the rest of the population by companies like Cadbury in England and Hershey in the U.S. The heart-shaped box of chocolates was an idea Richard Cadbury introduced in 1861. Now it’s a delicious Valentine’s Day favorite! If you’re looking for a recipe to make for Valentine’s Day, look no further – we have a wonderful chocolate cake recipe for you: a rich, moist chocolate cake with a hint of raspberry, made with unsweetened cocoa and raspberry Greek yogurt. Decadent AND healthy – just the way we like it. Happy Valentine’s Day!